WASHINGTON (Aviation Week) — With many different indigenous aircraft manufacturers, the airlines of the Commonwealth of Independent States (CIS) had — historically — plenty of choice when it came to selecting their fleet options. While many of those aircraft are still flying, modern types being produced in the CIS member states are much fewer. The Sukhoi Superjet 100 (SSJ100), which has been in service since 2011, and the Irkut MC-21, currently in flight testing, are the two programs leading the way. 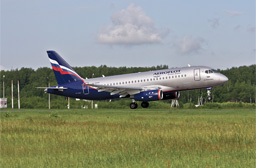 The SSJ100 has helped airlines develop regional international services, says Sukhoi. Airbus and Boeing have unsurprisingly led the imports used by CIS (Azerbaijan, Belarus, Kazakhstan, Kyrgyzstan, Armenia, Moldova, Russia, Tajikistan, Uzbekistan and associate member Turkmenistan) airlines. Crossover narrowbody jets from outside these countries have been few and far between. At home, the SSJ100 has had some success, with more than 100 of the 141 delivered going to CIS operators or lessors.